RANGPUR, July 17, 2018 (BSS) – Human rights activists at a workshop have stressed on enacting laws to ensure safety and security of the human rights defenders to promote their activities for protecting rights of the women and girls. 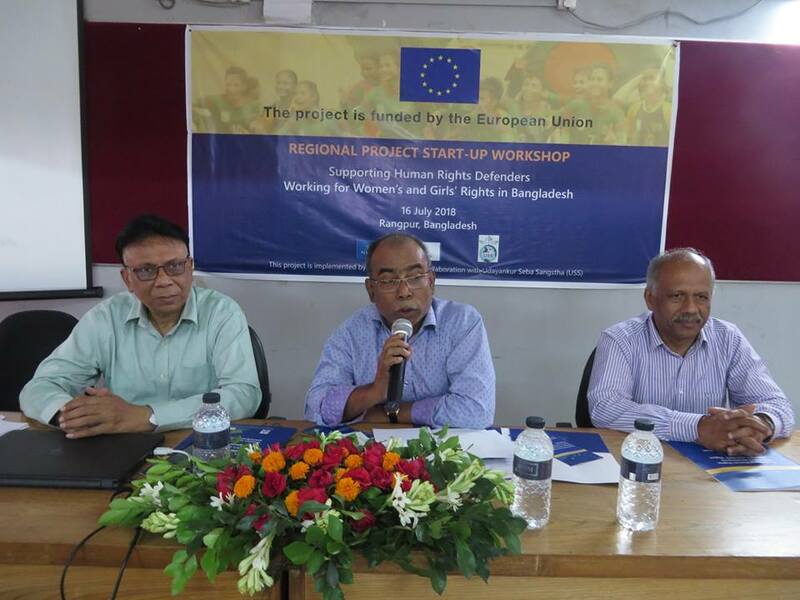 They expressed the views at the regional project start-up workshop styled ‘Supporting Human Rights Defenders Working for Women’s and Girls’ Rights in Bangladesh’ project held at RDRS auditorium here on Monday afternoon. The News Network jointly with Udayankur Seba Sangstha (USS) organised the event participated by 70 editors, journalists, NGO officials, religious leaders, human and women rights activists from five districts of Rangpur division. Chief Executive Officer and Editor of the News Network Shahiduzzaman presided over the workshop and narrated goals of the project being implemented in Rangpur, Satkhira, Jashore, Rajshahi, Nilphamari, Dinajpur, Lalmonirhat and Kurigram districts. Mayor of Rangpur Mostafizar Rahman Mostafa attended the event as the chief guest. Executive Director of USS Alauddin Ali as the special guest spoke on the occasion moderated by President of Rangpur Press Club Sadrul Alam Dulu. The participants raised issues and problems being faced by grassroots level human rights defenders while preventing repression, torture and violence against women, adolescents, child marriage and sexual harassment. Shahiduzzaman said the journalists, civil society members and religious leaders are working as human rights defenders without any legal protection to protect human rights of the oppressed and tortured women and girls to build a better society. “The government should stand beside the human rights defenders by enacting necessary laws so that they could contribute more to protect rights of the women and girls for their proper development to attain sustainable development goals (SDGs). The chief guest said the present government has taken sensible steps to ensure equal rights of the women for flourishing their talents and leadership to accelerate women empowerment at all levels for attaining the SDGs. Favouring for enactment of necessary laws for the human rights defenders, he stressed on joint efforts of government officials, public representatives and human rights activists for protecting human rights of the women and girls to speed up national progress.